It is an indisputable fact that a wheelbarrow is an essential tool in a myriad of niches that involve transportation of materials from one place to another. While owning a wheelbarrow may seem like no big deal, it takes some basic understanding of some essential tips to get one that will effectively cater to your needs and last longer. Having comprehensive knowledge about the different types of wheelbarrows available in the market as well as the different materials used to build them is the basic starting point for investing in the perfect wheelbarrow for your needs. With this knowledge, you can quickly determine the tasks that can be achieved by the model you plan to buy, its strength and durability, and even its effectiveness. Here, you will find perfectly detailed information about different types of wheelbarrows, the materials used to make them as well as their pros and cons, and finally, an all-inclusive buyer’s guide to direct you systematically on how to choose the right wheelbarrow for your diverse needs. The market divides wheelbarrows into different categories based on their design, materials and unique features. 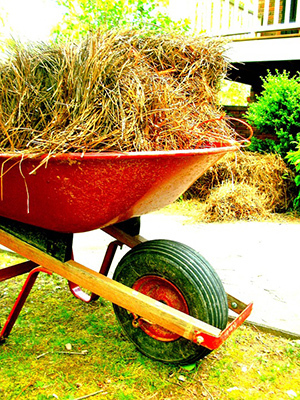 The most common materials used in wheelbarrows include steel, wood, and plastic. Each of these materials and wheelbarrow types bears their share of advantages and disadvantages. These will surely come in handy when you are choosing the right wheelbarrow for your needs. The most popular kinds of wheelbarrows we describe below. Most wheelbarrows are made of durable metals, with the most common choice being steel. Thank their sturdiness, these wheelbarrows can easily handle light to heavy tasks without being destroyed. Their frame, handles and load tub are usually made of steel or other durable metals. This fact ensures durability as well as resistance to destruction from weather conditions, which may otherwise result to cracking, rusting and corrosion when exposed to moisture, the sun or cold temperatures. 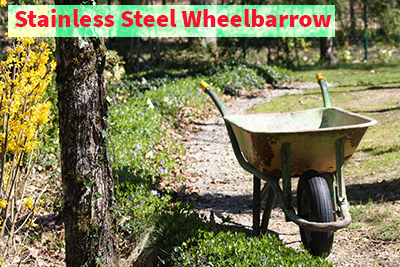 If stainless steel is a material for a wheelbarrow, you will not have problems with the rust. However, if you use other metals like iron, then you may need to repaint it frequently and avoid exposing it to moisture and water to prevent rusting. As much as steel and metallic wheelbarrows are massive, their strength and ability to cater for a wide range of jobs is an advantage that cannot be offered by most types of wheelbarrows. When and where are steel wheelbarrows used? Steel wheelbarrows are typical in multiple niches ranging from when you want to move heavy loads around your home or within your garden, to the industrial environment when transporting supplies and products from one area to the other. Since they are durable, sturdy and resistant to damage, steel and metal wheelbarrows can perform unlimited transportation tasks. They are available in a wide variety of designs. They are versatile such, so you can use them for a wide range of demanding jobs. They are not prone to rust, corrosion, scratches, cracking or breakage, thus great for heavy-duty jobs. You can paint them in a wide variety of colors. They are heavy thus hard to maneuver especially for users with limited energy levels. They get hot if placed in the sun for long. Plastic wheelbarrows are the second most common type among users. Plastic wheelbarrows are expected to cost much cheaper than their steel and metal counterparts do. This, therefore, suffices that it is ideal for people on a low budget. This type of wheelbarrow is also lighter than the metal and wooden wheelbarrows, thus more portable and more comfortable to maneuver especially when working in the farm. Unlike metal wheelbarrows that may rust when left outside at night or in the rain, with plastic wheelbarrows, you won’t need to worry about this. However, no matter how durable and sturdy the plastic is, there is a very high possibility of cracking if loaded with bulky items, which may eventually lead to complete destruction of the wheelbarrow. There is also another concern of plastic wheelbarrows losing their strength and quality when left in the sun for too long, or cracking when exposed to shallow temperatures. When and where are plastic wheelbarrows used? Thanks to their lightweight and ease of maneuverability, plastic wheelbarrows are best used in transporting items in areas with less defined passageways. Since they are weak, it is crucial that they are used only for light tasks like less demanding gardening chores. They are lightweight and easily portable. They are not susceptible to rust. They are available in many colors and designs. They are cheaper than most types of wheelbarrows. They are weaker and less durable. They are prone to be destroyed when exposed to extreme temperatures. Wooden wheelbarrows are quite rare and are mostly used as planters for aesthetic enhancement or storage purposes. These wheelbarrows are eco-friendly, thanks to their biodegradable properties. As much as they are not prone to cracking like plastic wheelbarrows or rusting like their metallic counterparts, they are very prone to moisture damage. When exposed to water or moisture for long, they become more massive, may rot, splinter and mold easily. For this reason, it is always advisable to store them in a covered storage area whenever they are not in use. When and where are wooden wheelbarrows used? Since wooden wheelbarrows are quite heavy without providing as much loading space, they are most commonly used for aesthetic enhancement of areas, for example by being used as decorative planters for flowers and ornamental plants. However, they can also be used for light to medium duty tasks and should be kept away from water and moisture, as these are known to damage them. They are friendly to the environment as they are biodegradable. They are not prone to rust, cracking and corrosion. They are prone to moisture and water damage by rotting, splintering and molding. 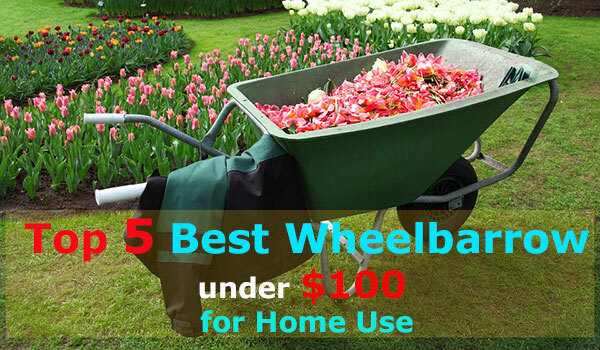 These wheelbarrows usually have their load tub made of durable canvas material. They are designed typically for ease of storage and loading of items. For instance, if you want to move a heavy load from the ground onto the wheelbarrow, you won’t need to carry it high off the field especially if it has the ground flush design that lays flat on the ground for loading and offloading. This makes it incredibly useful at home, especially for carrying large stable loads. It is also great for people with limited storage facilities. However, due to its flexible nature, you may not be able to carry specific loads such as sand, as it will pour out of it. It is also not feasible to take heavy loads on a canvas wheelbarrow. Canvas wheelbarrows are not made entirely of canvas; they usually have a metallic frame that may at times extend to the full tub for more stability. When and where are canvas wheelbarrows used? This type of wheelbarrows is commonly used by people who are conscious about storage space and don’t need to move heavy loads from one place to another on a frequent basis. Since they are flexible and foldable, they can comfortably fit under furniture and cabinets rather than taking an entire corner of the room like the other wheelbarrow types discussed above. They are flexible and foldable thus easy to store. They are easy to load and offload, especially the ground flush design. They offer perfect weight distribution as compared to the other wheelbarrow types with rigid load tubs. They are more affordable as compared to most wheelbarrow types. They are lighter, thus easier to maneuver even when fully loaded. They are not suitable for weighty loads. They won’t work great at transporting loads composed of many particles such as sand. Even though it is common for wheelbarrows to be made entirely of a single material, the case is different for some of them. Instead, they are composed of a combination of elements that are designed to ensure more effectiveness, strength, and durability. For instance, we may have a wheelbarrow with a stainless steel load tub and wooden frame, or one with a wooden or plastic load tub and metallic structure. Most of their wheels are made of durable rubber, whether pneumatic or non-pneumatic. Note that wheelbarrows can also be categorized depending on other factors such as wheel design, how they are propelled, strength and special features or functions. This type of wheelbarrow is composed of one wheel that is positioned in front of the wheelbarrow, at the center. This is the most popular wheelbarrow type since time immemorial. When compared to wheelbarrows with multiple wheels, they are the easiest to maneuver especially where space is an issue. However, they will require the user to have more upper body strength than the latter. Under this category, the most common type is the wheelbarrow with two wheels. They provide more stability, which is particularly handy for transporting heavy or unbalanced loads. However, they are less maneuverable as compared to the single wheeled barrow and they may be hard to use on inclined terrain. While the double-wheeled barrow offers less maneuverability compared to the single wheeled one, it is much easier to maneuver as compared to the three- and four-wheeled barrow that has started gaining popularity lately. 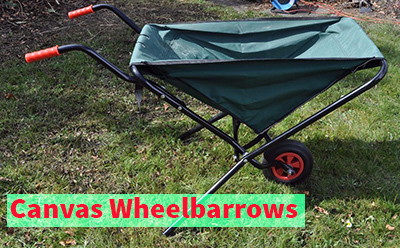 This type of wheelbarrow features tires that can be inflated like bicycle wheels as they have internal tubes that should be filled with air to act as a shock absorber. These kinds of wheelbarrows are known to offer a smoother transportation experience, especially when traversing rough terrain. However, their wheels need to be inflated from time to time to ensure constant air pressure and that you don’t experience a flat tire unexpectedly. These wheelbarrows consist of solid rubber tires that will never go flat under any circumstance. Since they don’t have an inflatable internal air tube, they can be used safely in rough conditions such as areas with sharp rocks, cactuses or even extreme temperatures without the risk of popping or puncturing the tire. Since their wheels do not need frequent air refills, these wheelbarrows are low-maintenance, which is great for any owner. This one is a genius compromise between the pneumatic and non-pneumatic types. For shock absorption, the semi-pneumatic wheelbarrow tires are built with internal air pockets that do not require pumping of air into them. On the other hand, they are reliable enough to provide sturdiness, thus great for use in rough conditions without being punctured and going flat. This wheelbarrow type is purely propelled manually. It requires you to use your physical energy to push it forward and is severe when carrying weighty loads. This is the most common wheelbarrow in the market, and it is more affordable than the motorized one. This kind of wheelbarrow makes use of electric power to propel the wheels, thus leaving you with the task of maneuvering it. It is the most suitable for weighty loads, the main reason why it is only common in the industrial and manufacturing environment. It is not common among gardeners or at home. It comes with a prohibitive price tag and will require maintenance and repair procedures that are more complex than the traditional manual wheelbarrow. These are designed specifically for tough transportation tasks. They work correctly in the manufacturing scene, as they are stronger and more durable, with a higher weight and load capacity limit. They prominent in size and heavy, thus harder to maneuver. Their load capacity is in the range of at least eight cubic feet. 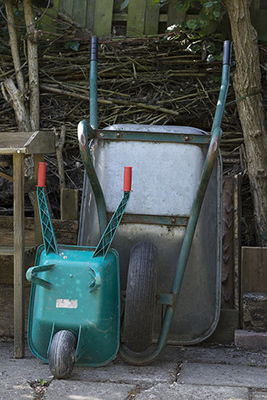 These are the smaller, most common type of wheelbarrows that you will find in many homes. They are light, and they have a low weight, and load capacity limit than other types. Their capacity goes up to 5 cubic feet, which is suitable for lighter and smaller loads as compared to the medium-duty wheelbarrow whose size ranges from 5 to 8 cubic feet. While these are the most common wheelbarrow types, other categories usually come up depending on their unique features or functions. For instance, the planter wheelbarrow is designed for planting ornamental plants, the ground flush wheelbarrow can easily stretch and lay flat on the ground for easier loading and offloading, while the foldable wheelbarrow offers easier storage as it can fold into a smaller version of itself, which fits perfectly in tight spaces. Choosing a wheelbarrow may not seem like a big deal, but selecting the best type that will serve you effectively for longer, and cater for all your needs will require some consideration of relevant factors. With the factors and tips discussed below, it will be entirely accessible to find the ideal barrow for you. The first step to finding the perfect wheelbarrow is identifying your needs, which is the reason why you need the wheelbarrow. For instance, if you want to transport huge and heavy loads, then it is necessary to choose a heavy-duty wheelbarrow with high load capacity and weight limit. This ensures that the frame does not break under pressure from the heavy load as would have been if you were to use a light duty wheelbarrow. If your needs are as simple as more quiet operation, then metallic wheelbarrows will not be a suitable option. Instead, it would be better to invest in plastic or wooden ones, which do not produce a lot of noise during loading and offloading. Identifying your specific needs, no matter how simple or complex they may seem, is very handy when it comes to choosing the exact model that will serve you with diligence. The construction materials and the build quality are significant determinants of the strength and durability of a wheelbarrow. 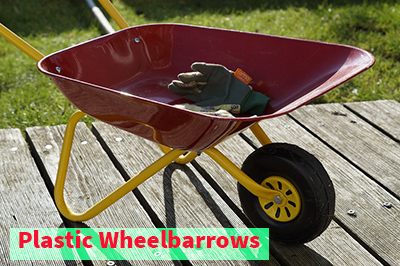 If you are after the strongest and most durable, then you should go for the metallic or steel wheelbarrow. However, since this comes with a high price tag, you may have to look for sturdy plastic or wooden wheelbarrows if you are working on a low budget. Apart from ensuring that the materials used in your wheelbarrow are not weak and flimsy, it is essential to look at its build quality too. Make sure that all connections and joints are securely affixed. Since your wheelbarrow will be performing heavy tasks frequently, having a reliable quality of construction will prevent incidences of parts of the wheelbarrow falling apart during and after use. Any vehicle that is hard to maneuver is not anyone’s dream, mainly if it is operated manually like the wheelbarrow. This means that you should ensure that the wheelbarrow you purchase is easy to maneuver. First, unless you want to go heavy-duty, you should choose one that is significantly light and compact, with one or two wheels. This ensures that you can easily maneuver it even when space is constrained such as in the garden. A heavy wheelbarrow will require you to have the more upper body strength to be able to move it, especially when it is fully laden. The perfect wheelbarrow should possess a design that makes it easily portable and maneuverable. Depending on how much load you want to transport, you will be able to determine the suitable capacity and weight limit of the wheelbarrow you want to invest in. For heavy loads, it is best to find a wheelbarrow with higher load capacity, and you may even reinforce it further for even heavier loads. The lighter items you transport, the lower capacity of wheelbarrow you will need. The size of the load is also a determinant of the ideal function of the wheelbarrow you choose. More significant loads will require larger load tub capacity while smaller loads will require smaller load tub capacity. 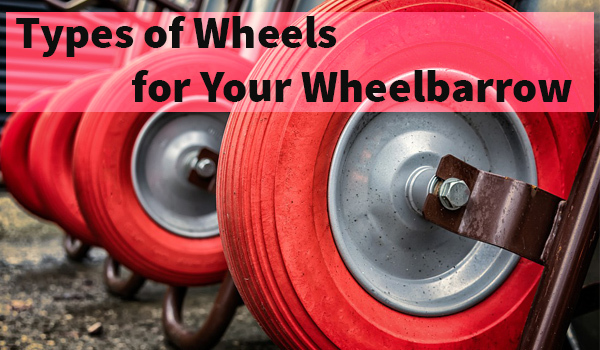 Also read: What Types of Wheels are Best Suited for Your Wheelbarrow? The size and weight of the load should always be proportional to the load tub capacity and weight limit of the wheelbarrow respectively. Otherwise, it wouldn’t make sense to carry one potted plant on a huge ten cubic foot wheelbarrow, or a massive tank on a small five cubic foot wheelbarrow. Since you will be pushing the wheelbarrow around with lots of stuff on it, it is critical that the whole experience remains as comfortable as possible. First, the handles should be of the right length as very short handles could lead to poor posture that may cause back pain. The stems should be ergonomically designed to offer comfort and cushioning while preventing slippage. It is best if the handles are made of rubber grips. The number of wheels is also a factor that will determine ease of use and comfort. A single-wheeled barrow is easy to maneuver, a double-wheeled one offers more comfort, but the ideal one is the three-wheelbarrow that is the easier to operate, offers better support and is best for people with physical limitations such as disability or sickness. 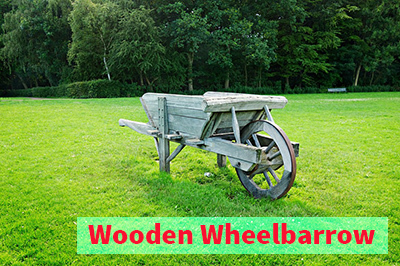 Depending on the type of terrain you will be using the wheelbarrow on, you can deliberate on the type and number of wheels that is best, as well as the general design of the wheelbarrow. For instance, in rocky terrain, a wheelbarrow with non-pneumatic wheels is perfect as you won’t have to worry about punctures and flat tires. In fact, a single-wheeled design may not work as best as a wheelbarrow with two or three wheels on such terrain. If you are carrying fragile items across rough terrain, then you should use a wheelbarrow with pneumatic wheels as they absorb most of the shock, thus keeping the details safer. For very inclined terrains, the four-wheeled barrow, otherwise known as the garden cart will not hold, as it will be hard to maneuver. In such cases, a wheelbarrow with one or two is better. With the above factors in mind, finding the ideal wheelbarrow should no longer be a problem for anyone. There are different stores from which you can purchase your wheelbarrow, both online and offline. All you need to do is identify a couple of wheelbarrow models that can cater to your needs, seek recommendations and check out user reviews and ratings before making your final investment decision. You should always be on the lookout for offers and discounts on your best models, and you may land an unbelievable bargain. With your budget in hand and the tips discussed above, you will surely get the wheelbarrow you have always desired to own. 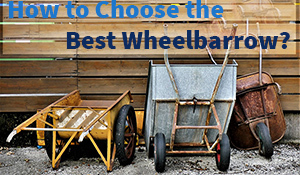 ← What Types of Wheels are Best Suited for Your Wheelbarrow?